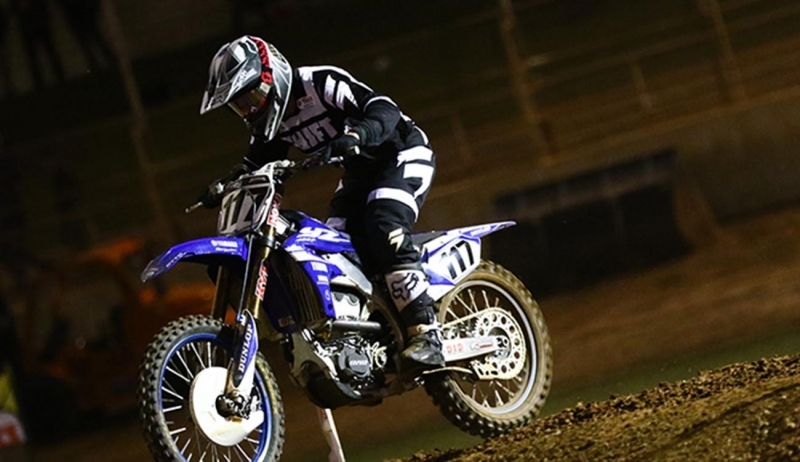 Dylan Long has secured his best result since joining the CDR Yamaha team with a stunning second place finish at round three of the Australian Supercross Championships held at the Adelaide Motorsport Park on Saturday Night. Long has consistently improved since returning from injury mid way through the year and is now beginning to hit full stride as his fitness, race craft and speed return to 100%. With each passing rounds, Long has steadily improved with 7-4 results at the opening round and the podium result was a great reward for him and the CDR Yamaha team after putting in the hard yards over the past few months. “It feels awesome to finally get back up on the podium, my first time with CDR Yamaha,” Long says enthusiastically. “Its taken a while to get back to where I need to be but I’m so pumped to finish second tonight and within sight of Justin. Long got off to a good start in the 20lap SX1 (450cc) main event and was able to stay clear of the first lap chaos as riders jostled for position. At the completion of lap one, Long was in second and hot on the heels of US import and series leader, Justin Brayton. Long stuck to the task and didn’t let Brayton slip away. He maintained his intensity for the opening half of the race and was within a few seconds of the leader before backing it down to take the podium position. “I think I saw a pitboard from Brad that said we had five or six laps to go and I had a pretty good gap over third place so I decided to calm down a little, maintain my position and finish in second place. “I’m so glad to finally give CDR Yamaha a result they can be proud of. Its been a long season but things have turned around and everyone at CDR Yamaha has had my back and I can’t thank them enough for their support,” Long ends. It was the first time in over 12 months that Dean Ferris has missed the podium in Australia. With a streak starting back at the midday point of the 2016 MX Nationals season, Ferris has maintained a top two finish since then but that phenomenal run has come to an end when Ferris placed fourth on Saturday Night. Ferris gated well in the main event and was inside the top four when the field roared into turn two. The rider in front of Ferris miscued a double jump and went down and left Dean with no where to go and was caught in the carnage and also hit the deck. Ferris remounted in last place and began to drag his way back through the field. He quickly charged his way to sixth place, then put on two aggressive moves to move into fourth. But with only a handful of laps remaining, Ferris was unable to improve his position and had to settle for a hard-fought fourth place. “It’s a disappointing result, that’s for sure,” Ferris shrugs after the race. “I had a pretty good start and was just behind Luke Clout, who was leading the race, when he went down after the double going into the second corner and I got caught up in that and also crashed. “I got up and moving as quick as I could and still had a goal of getting back onto the podium but I could only get to fourth. As you get closer to the front, the riders get harder to pass and on a track like this, you either had to wait for a mistake from them or pull and aggressive move and I had to do a few of them in the later stages of the race. “I can’t complain too much if fourth is the worst result I have had in over 12 months, but I’m determined not to make a habit of it. I put in a good couple of weeks with the team since round two and felt much better tonight so we are going to keep pushing for a race win and look forward to the Aus- X open in a couple of weeks’ time,” Ferris said. Rounds for four and five now move to Qudos Bank Arena in Sydney for the jewel in the Australian Supercross Championship series, the Aus- X Open. CDR Yamaha’s Ferris and Long with pit themselves against a host of US riders bought in especially for the event in front of a capacity crowd over two big nights of racing. With Ferris sitting in second place and Long now jumping to third after a successful weekend in Adelaide, both riders are poised for a great weekend in Sydney.